Chemical Peel without the redness & rawness! Do you want to feel younger, more youthfull and full of life again? Then you need Gamma Hydroxy in your life! Quite simply, Gamma Hydroxy is the good type of chemical peel for your skin without the usual redness and rawness that we associate with a typical chemical peel! (Remember Patsy in Ab-Fab? Ouch we all said!) This proprietary blend of glycolic, lactic and salicylic acid function together for the ultimate in skin resurfacing. This new generation formula from skin care experts Skin Doctors blends the 'good' hydroxy acids to have a cosmetic resurfacing effect on your complexion, which, with regular use, has effects likening to that of a chemical peel.But don't worry! 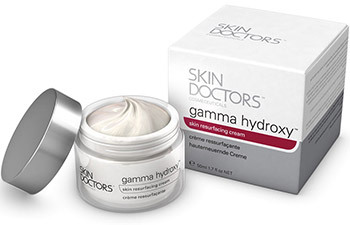 Gamma Hydroxy is carefully balanced so that the beautiful, smoothing effect happens gradually over a number of weeks- causing no excessively harsh irritation to the skin. This ingredient breaks down the top layer of your skin to get rid of dead cells, taking blackheads and blocked pores with it. By getting rid of your dead skin cells it increases the renewal of your skin which will help reduce the signs of aging, as the top layer of your skin will just be new, healthy cells. It even works on cystic acne, as it is able to penetrate the deep blockages that cause it. This is the most gentle of the hydroxy acids, working on the surface of your skin. 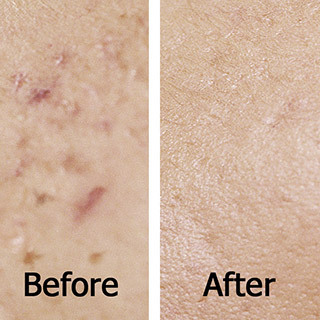 It will gently lighten hyperpgimentation, acne scars and uneven skin tone. If you have dry skin, lactic acid has wonderful softening abilities; it's derived from milk and will give your skin a lovely creamy texture! Dissolves oil and dead skin cells - this makes it wonderful for treating acne as the less oil there is on your face, the less spots you'll have! It will reach into your pores and clear out all the muck, getting rick of blackheads and whiteheads as it goes.By regularly using creams containing these acids, you will keep seeing new improvements in your skin as they increase the renewal of your cells. Ingredients: Water (Aqua), Ethylhexyl Methoxycinnamate, Glycolic Acid, Benzophenone-3, Propylene Glycol, Cyclopentasiloxane, Cetyl Alcohol, Stearyl Alcohol, Cyclohexasiloxane, Lactic Acid, Butyl Methoxydibenzoylmethane, Arctostaphylos Uva Ursi (Bearberry) Leaf Extract, Glycerin, Sodium Hydroxide, Glyceryl Stearate, PEG-100 Stearate, Ceteareth-20, Salicylic Acid, Phenyl Trimethicone, Magnesium Ascorbyl Phosphate, Xanthan Gum, Disodium EDTA, Sodium Hyaluronate, Phenoxyethanol, Methylparaben, Ethylparaben, Butylparaben, Isobutylparaben, Fragrance (Parfum), Citronellol, Hexyl Cinnamal, Limonene, Butylphenyl Methylpropional.